Centralizing project permit processing, preparing for autonomous vehicles, increasing freight throughput between modes, and replacing the nation’s aging bus fleets are just some of the many challenges ahead for the nation’s transportation system. In a roundtable discussion held at the American Association of State Highway and Transportation Officials 2019 Washington Briefing on Feb. 28, seven key federal agency executives examined those challenges and what they are doing to confront them. Herrgott noted that his council – housed with the General Services Administration – was created by the Fixing America’s Surface Transportation or FAST Act of 2015 to be a “one stop shop” for the federal government to get projects permitted. By having all the different federal agencies work through his council as a “driver” of the permitting process would, by extension, reduce the cost and the time required to get projects off the ground. Hergott pointed out that sometimes “a shovel can’t be put in the ground” until three or four years after a project is announced due to all the permitting requirements. Brandye Hendrickson, deputy administrator of the Federal Highway Administration, echoed that sentiment, noting that “there is a lot of bipartisan support for strengthening our infrastructure” as well as continued support for lessening the regulatory upon the states as well when it comes to transportation. 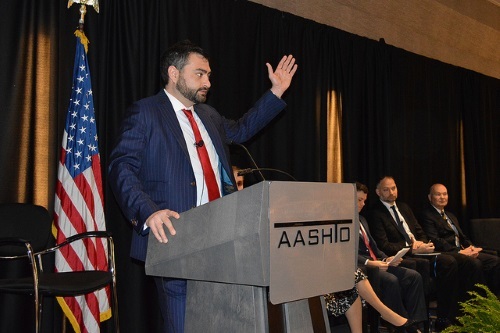 On the subject of autonomous vehicles, Brian Barnard – director of government affairs for the National Highway Traffic Safety Administration – noted that trying to encourage innovation while ensuring safe deployment of new technologies remains a challenge. “For such technology to save lives, the public must be able to use them and trust that they will work,” he said, adding that his agency is already involved in establishing a pilot program to study the impact of vehicle automation. In terms of freight demand, Rear Admiral Mark “Buz” Buzby USN (Ret. ), head of the Maritime Administration, noted that making the nation’s ports become more efficient and effective will require a “multimodal” focus that includes highways, railroads, and inland waterways. Buzby added that there is “real ability” of such burgeoning freight demand to create “significant bottlenecks,” tying up the nation’s road and rail system. By extension, that means other surface transportation avenues for cargo should be encouraged. “We can relieve stress on highways and railways by using ‘blue highway’ inland waterway system,” he pointed out. Stephen Gardner, senior executive vice president and chief commercial marketing and strategy officer for Amtrak, noted a similar throughput challenge is developing in the passenger transportation sector due to demographic changes. K. Jane Williams, acting administrator for the Federal Transit Administration, added that such mass transit infrastructure investment discussions are becoming more critical across the local, state, and federal level. “Buses, for example; they are really the workhorses of transit – the most widely used form of transit. And they are aging,” she said.